Centre for Sustainability, Growth and Development is a Centre of Excellence currently operational at IMT Nagpur. It was established in the academic year 2012-13 with a mission to apply sustainable principles to development projects that meet present and future organizational goals and societal needs. Sustainability,as we understand at CSGD, is not only about environment, it's about people, business and economies and society at large. 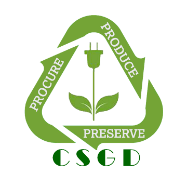 At CSGD, we have undertaken several activities to further the purpose.